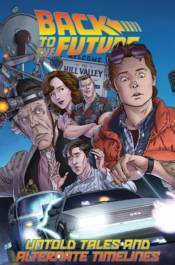 BTTF creator/screenwriter Bob Gale returns with all new tales from the twisting and turning timeline that made Back to the Future a, well�. TIMELESS pop-culture phenomenon! From the Old West forward to the 1980s, from the 21st Century back to the Jurassic Period� and every time in between� Doc, Marty, along with their friends and enemies, embark on time-space continuum adventures of epic proportions!